NVIDIA’s GTX 560 Ti is set to launch on Jan 25th. 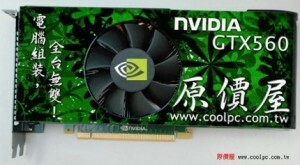 However, Taiwanese site, CoolPC.com.tw, has released pictures of the reference card. They got pulled before too long, but not before we snagged a copy for you to enjoy (courtesy of Hexus.net)! Now, don’t get too excited – these are not going to be breaking any benchmarks for your top-of-the-line rig. NVIDIA is positioning these cards as something between their performance and middle of the road cards. 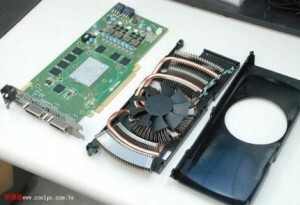 Based on details from Hexus.net, the GTX 560 Ti will be using the new GF114 GPU with a 1GB frame buffer. It’s core clock will be roughly 823 MHz, which equates to 1,646 MHz for the 384 CUDA cores. Also, the GF114 GPU and its 1GB frame buffer will be connected via a 256-bit bus. What does all that gibberish mean in terms of performance? 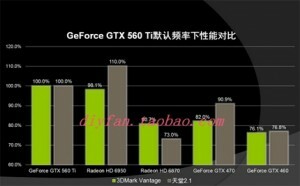 Check out the benchmarks released by diyfan.taobao.com and see for yourself how the card stacks up, even before it’s even released. It looks like the card is on par with AMD’s new HD 6950 card that we recently reviewed. The GTX 560 Ti seems like a direct response to AMD’s cornering of the $300 price-point. It will be interesting to see what the 560 will sell for. It’s also interesting that the GTX 560 Ti brings back the titanium moniker from many moons ago. It seems like marketing department is doing some recycling with their card names. Anyway, let’s take a peek at the card shall we? From the top view it’s nothing too impressive, but remember that this is a reference model card. As Hexus.net mentioned, you’d think it was a GTX 460 if not for the label. Not to worry, as the flashy retail cards with massive cooling solutions will hit the shelves soon after launch. Moving on to the other pictures, we get a view of the board itself and the reference design heatsink. Note that the card will require two 6-pin PCIe power connectors, falling in line with most cards in the range. Initial speculation puts the price in the $350 to $365 range, but I think that’s a bit high considering its initial performance benchmarks. Time will tell, as this card will be hitting the shelves in a few days. Excellent article! I really love the analysis sprinkled in. Great job Jmtyra. It should have been proofread a little more for typos/punctuation, but it looks good all-in-all. I hope these aren't priced at $350, that's the price of a GTX570... I would expect more around $300, but we'll have to wait and see. I think the price estimate is a bit off... that is the range the GTX 570 is currently selling in. Based on the performance like you said it should be lower. I was thinking 250-300, the lower side of that especially for the reference cards. Considering 460s are pretty much all in the sub 200s now, nVidia needs something to fill that 200-300 range and the 560 should be it. Sweet. Where is this info from? Also where did you hear the Gigabyte card was going to be 300? Sorry bud, I didn't see that thread. I'm always on the hunt, though! Shoot me a PM when you get some more newsworthy info, especially if you have a scoop like that. Excellent (though first sentence still comma heavy, no?) article. Hopefully you keep this momentum going!!! Ya I was editing, typing, going back editing. The editing team should catch that... it happens. The content blew me away however! Newegg is already showing a galaxy card. Today, the 25th, is the launch day. Vendors should be showing their available selection. Although they may have been 30 minutes early. Silly newegg! The galexy card is up on amazon also, still no others yet. i'm hoping for something with a better cooler, i do like the look of the gigabyte. the only one i saw that included OC'ing was the techspot one on the gigabyte. they got 1010 on the core. not bad!